Tutorial: What is Wiseplay’s Browser for? Who can make and distribute .w3u lists? Why doesn't a list synchronize? Why do some lists say you have to pay for them? If a video or a list does not work, can you solve this? There are different ways of loading lists in Wiseplay. In this tutorial we will show you the available options. To add a list using a URL, first you must make sure it is a valid list and it is active in the server. Then click on the (+) button. Then, introduce the address of the list, as the window indicates, Wiseplay in compatible with w3u or m3u lists. If you have previously copied the list just click on the Paste option and the hit** OK**. You can also copy the list manually. Your list will be successfully loaded on the app. It is possible that an error message appears and the list does not import, if this happens, check your Wi-Fi or data connection is working and the list you are trying to import is correctly written and active in its server. 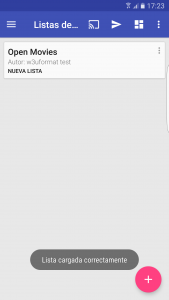 If the message “List Imported Successfully” appears and the list is not listed, please close the app and open it again. Please Note. This option just appears if your device has a camera to read QR codes. From the 6.0 Android Version on the system will require permission for the app to use the camera. 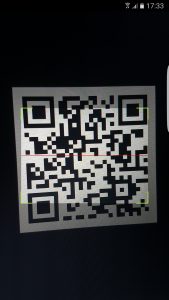 Once you have accepted, you can now capture any QR code with a w3u or m3u list information. You can capture all the QR codes you want straightaway and they will add to the lists, until you hit “back” the capture mode will remain active. If you want to know how to generate QR codes, please visit this tutorial. If you have found a list you want to load while you were surfing the Internet with your mobile device, you can easily import it to the app, all the compatible links will be automatically offered to be opened with Wiseplay. Here you are an example. 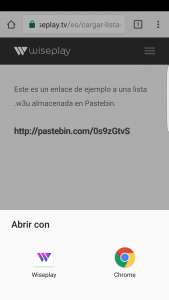 Visiting a web, we found a link to a w3u list, in this case a list hosted in Pastebin. 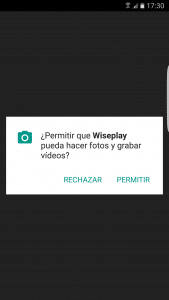 Once you click on it, you can open it using Wiseplay. We choose the option and the app will automatically import the list. This option is valid for w3u or m3u lists, hosted in text servers as well as saved directly in a folder with its ending. 4. Adding a List from a File. Even though it is common that a list is hosted in a server or a text server, sometimes there are lists hosted in a local file, this is very common for m3u, this format doesn’t have as much synchronicity capacity as w3u. Using the Android files explorer of your choice, access the folder where you keep the list you want to import. In this example we have used ES File Explorer, but you can choose any explorer you like. Click on the list you want to import and the app will automatically do it. If you have other apps compatible with w3u, other options may appear to open it. This process is the same for any app, for example, if a friend emails you a list or texts it, you can import it this way.